The Long Grazing Acre is a perfectly crafted and packaged concept. Paddy Keenan achieves phenomenal tone with his uilleann pipes and whistles and, together with guitarist Tommy O’Sullivan and engineer Pearse Dunne, blends this tone with O’Sullivan’s thick, rich strings and the other elements for an excellent production. Also noteworthy in this album is liner-note commentary, a look at the inspiration behind the writing of each portion. This album is a well-balanced blend of reels and jigs (i.e. upbeat, danceable instrumentals), tunes (mournful instrumentals, usually giving the spotlight to Keenan’s whistles) and folk songs featuring O’Sullivan’s vocals and acoustic guitar. Cause you daren’t discover, daren’t discover that we really care. 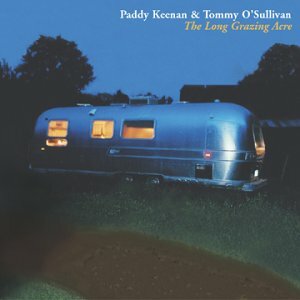 Between its lyrics, the thoughts on the album’s inspiration and the quality production and tones, The Long Grazing Acre beats with the heart of Irish music.